Mom Knows Best : Free Friday Download At Smiths(Kroger stores) Is A Box Of 5 Count Of South Beach Snack Bars! 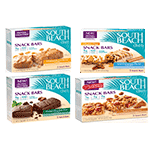 Free Friday Download At Smiths(Kroger stores) Is A Box Of 5 Count Of South Beach Snack Bars! Ugh I wish I lived closer to this store ..they seem to have way better deals than the stores around me !